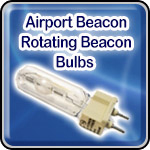 Airport Beacon Bulbs - Rotating Beacon Bulbs - Airport Lighting - There are 3 types of airport lighting beacon lamps. Par 64 quartz halogen, T20 size incandescent, and Metal Halide. Wattages range from 250 thru 1000. These bulbs are used in medium and high intensity rotating beacons. These lamps meet the FAA L-801 and L-802 requirements.